Lawrence Meyers is a Judge in one of the highest Courts in Texas, the Texas Court of Criminal Appeals. Meyers might run as a Republican but he is not a Republican and he is a moderate at best. Just last year, Meyers almost switched to officially being a Democrat. 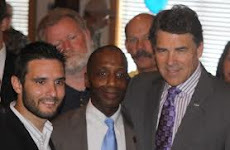 Even the most moderate Republicans in Texas would never claim that they want to be a Democrat on Obama's team! I guess that would make Meyers more liberal than he is moderate. Meyers is not stupid though and he knew that if he switched to Democrat in Texas then he would not get elected again as Judge in a solidly Republican state like Texas, so he stayed Republican. He is not one though, and he sure is an embarrassment to the State now more than ever. JUDGE Meyers is all over the news this week for having an arrest warrant issued against him because he refuses to pay a speeding ticket! WOW! The longest serving judge on Texas’ highest criminal court has a warrant out for his arrest, issued by an Austin municipal court judge, for failure to pay a 2008 speeding ticket, the American-Statesman has found. The arrest warrant for Lawrence Meyers, a 19-year judge on the Texas Court of Criminal Appeals, has been active since Oct. 20 and is the third time Meyers has faced possible arrest in his long-running battle over a $193 ticket for driving 19 miles over the speed limit on Interstate 35. The case — repeatedly delayed at Meyers’ request and by legal challenges rarely pursued in traffic court — appeared to be over on Aug. 8, when Meyers pleaded guilty to speeding and was given two months to pay what had become a $481 fine, including court costs and related fees. But when officials didn’t receive payment, Municipal Judge Ferdinand D. Clervi signed the warrant for Meyers’ arrest, meaning he could be taken to Travis County Jail at any time. This week, Meyers said he declined to pay the fine because doing so would end his case, and therefore his ability to file an appeal based on what he alleges to be mistakes by Clervi. According to Meyers, he approached Clervi intending to plead guilty and pay the fine, which he expected to be $100 to $200, based on the speed he had been traveling. Meyers said Clervi declined to take his guilty plea, giving him only two options: post a $500 bond and go to trial, or accept a plea deal from prosecutors to pay $481. Feeling pressured, Meyers said, he accepted the deal with the intent of later filing an appeal seeking to overturn the conviction. That writ of habeas corpus — a legal challenge common in Meyers’ court but seldom seen in municipal court — will argue that Clervi violated Meyers’ right to make a plea in court and approved an excessive fine. Clervi and Presiding Austin Municipal Court Judge Evelyn McKee declined to discuss Meyers’ case because it appears to be ongoing. Meyers’ legal tangle began Aug. 12, 2008, when he was pulled over for driving 79 mph in what was then a 60 mph zone near St. John’s Avenue in North Austin. Meyers submitted a not guilty plea but failed to show up for his court date the next month, city records show. The case apparently languished for a year, until Meyers requested a new court date, saying he wasn’t informed about the original trial. The request was granted, and his case eventually landed on the Aug. 13, 2010 docket, when Meyers pleaded no contest and was given 90 days to pay a $200 fine, city records show. The deadline, however, passed without payment, leading Municipal Court Judge Kirk Kuykendall to issue a bench warrant for Meyers’ arrest on Feb. 20, 2011. • After two months under an active arrest warrant, Meyers filed a writ of habeas corpus seeking to overturn the judgment against him and restart the case. Municipal Court Judge Celeste Villarreal granted the writ, the arrest warrant was voided, and Meyers’ case was reset for a hearing on Aug. 12. • On that date, Meyers was again given 90 days to pay a $200 fine for speeding. Instead, he filed a motion for a new trial, which was granted last January. • Meyers’ new trial was delayed six times this year, mostly at his request. His bid for a seventh delay, however, was rejected on June 29. When Meyers failed to appear that day for trial, Municipal Court Judge Rebecca Sonego signed a bench warrant for his arrest. • Meyers appeared before Clervi on Aug. 8, pleaded guilty and was given one month to pay $481 in fines and fees. At Meyers’ request, Clervi extended the deadline another month — but when no payment was received, he eventually signed the current bench warrant seeking Meyers’ arrest. By then, Clervi was the 13th municipal court judge to oversee a portion of Meyers’ case. It is unlikely that police will track down and arrest Meyers because law enforcement seldom actively pursues warrants for traffic violations. However, such defendants are routinely arrested if they are pulled over again and a records search finds an outstanding warrant. Meyers also has a second case pending in Austin Municipal Court for an unpaid fine after a city red light camera photographed his car running a stoplight at Interstate 35 and East 11th Street in January 2010. Records show Meyers hasn’t paid a $75 fine and $25 late fee for the infraction, a civil matter for which defendants don’t face arrest.